Canon Pixma MG5450 is an all in one reliable multifunction printer designed for home users, particularly for those who want to print photos and on discs, as well as paper documents. The device is equipped with both Wifi and Ethernet for easy networking and printing from the cloud or mobile devices. Canon Pixma MG5450 ink cartridges produces prints with clean, black text and bright, solid colours. The design of this multifunction printer is stylish, sleek and comes in black colour. It has a control panel with 75mm colour LCD display screen along with three dedicated selection buttons below, combined with a separate four-way navigation controller and selection button. At the front, the full-width cover folds down to become the output tray that can hold up to 20 sheets of paper. Below it, there is a neat arrangement for twin trays, one is for the document papers which can store up to 125 sheets and the other is for photo blanks. It also has USB port and Wi-Fi setup for better connectivity option. The device comes with automatic duplexer for double sided printing to reduce the paper wastage. It also allows mobile printing and supports Apple's AirPrint. The device also allows users to directly print from memory cards and features PictBridge slot for digital cameras. The printing resolution of this device is up to 9,600 x 2,400 dpi and the scanning resolution is up to 2,400 x 4,800 dpi. The device is compatible with Windows and Mac operating systems. Canon Pixma MG5450 is a good multifunction printer, with useful features such as wired and wireless connectivity options, automatic duplexing, mobile printing, disc printing and direct printing from memory cards and PictBridge slot etc. The Canon Pixma MG5450 ink cartridges are low priced, they result in a low running cost and therefore increase the overall efficiency of the printer. However, lack of fax and ADF support are the drawbacks of this device which might not be suitable for business groups working on a large scale. How to replace an ink tank? 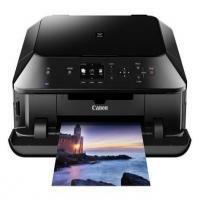 The Canon Pixma MG5450 is a great photo printer. It offers good print quality and uses Canon Pixma MG5450 ink cartridges as consumables. The printer is easy to setup. When you need to replace the ink cartridges you need to be a little careful while doing it. Though the process is simple and easy the handling of Canon Pixma MG5450 ink cartridges requires care. Hold the sides of the paper output tray and open the lid gently. Lift the operation panel up till it stops moving further. The print head holder will move from its home position to replacement position. You will see the cartridge holder. Do not move it forcibly or stop it in motion. Doing so will damage your printer. If you leave the printer like this for long, the print head holder will move back to its home position. In this case, close the lid and open it again. The holder will move back to the replacement position. You will see the ink cartridges. Press the release lever and remove the ink cartridges that need replacement. Take the new Canon Pixma MG5450 ink cartridges and remove the packaging. Take off the orange tape on the ink cartridge then remove the protective film from the cartridge. You should only open the cartridge prior to use. Opening it much before reduce its shellfire drastically. Then it is good for use only for 6 months. Hold the ink cartridge with the orange protective cap facing upwards. DO not block the air hole. Lift up the tab of this cap and remove it gently. Place the prepared ink cartridge into the slot and press till it clicks into place. Close the operation panel and the lid. Q. The waste ink absorber is almost full. What should i do? A. The purpose of the waste ink absorber is to safely collect any of the waste ink expelled during cleaning of the print head and borderless printing on photo printers. Over time this waste ink absorber can become full and will need to be replaced. For the replacement of the waste ink absorber you need to contact to the authorised repair centre in order to prevent ink leakage which can cause damage to the printer. Q. How can i use other functions when the printer is out of ink? A. It is possible to use the other functions of your product when an ‘out of ink’ error message is displayed on the screen. To do this it is necessary for you to first clear the error message by pressing and holding the machine’s [Resume/Cancel] button for 5 seconds. Once the error has been cleared, other functions like scanning can be used. Make sure that if printing is attempted after clearing the error, the quality of prints cannot be guaranteed. Once you cleared the error message, the remaining ink level will be unknown and damage may occur within the printhead. We recommend replacing the Canon Pixma MG5450 ink cartridges to avoid this from happening. Q. What things i should keep in mind, while installing the new cartridges? You cannot print if the Canon Pixma MG5450 ink cartridges are installed in the wrong position. Install the ink cartridge in the correct position according to the label on the print head holder. You cannot print until all the ink tanks are installed at their places, so make sure that they are properly installed . Q. Can you guide me on cleaning my Canon Pixma MG5450 printer? A. You should clean your printer several times a year to keep its working at its best. When not in use close the output tray and front cover to protect the printer from dust. To start cleaning process, turn off the product first, unplug all the cables, remove all the papers, clean the scanner with a soft cloth moistened with a little glass cleaner (do not press the scanner glass forcefully), the control panel and the outer case can be cleaned with a soft, dry cloth. Don’t let liquid solution (water, oil, lubricant, etc.) get inside it. For more detailed information with image tutorial, you can refer the printer manual that came along with your printer. Q. Are there any good quality replacement available in place of original Canon Pixma MG5450 ink cartridges ? Q. What is the shelf life of these compatible Canon PGI-550XL and CLI-551XL Canon Pixma MG5450 ink cartridges? A. If stored correctly in cool and dry place these compatible Canon PGI-550XL and CLI-551XL ink cartridges (Canon Pixma MG5450 ink cartridges) will have a shelf life of about 12 months from the date of purchase. Q. Hi there, I have a Canon Pixma MG5450 printer which suddenly stopped working. Can you tell whatever the reasons can be? It might be possible your printer and all the other connecting devices are not turned on. The printer is too far away from the access point or router. The printer is not set as the default printer. The PC to use the printer is not connected to the network. MP driver settings are wrong. The access point or its settings are changed. Step 1: Confirm that the access point or router is turned on. If they are already turned on, turn them off including the printer, and turn them on again. If the problem is not solved, proceed to the next step. Step 2: It might be possible that the printer is too far from access points. Move the device nearer to the access point or router. Restart the printer and try printing again. If this does not work, perform the printer settings again and re-connect the printer to the access point or router. If this does not resolve the issue, proceed to the next step. Step 3: Go to the control panel of your computer and then go to one of the following tabs: [Printers and Faxes] or [Devices and Printers] or [Printers] Make sure the printer which is check-marked is your current printer model that you are trying to work on. If not, then find your printer in the list and right-click on it. Select “Set as default printer” and then try printing again. Go to the next step if nothing happens. Step 4: It is also possible that the printer is connected to the network but the PC is not. Check the computer's network connection by opening any internet page on your browser. If the page does not open, connect the printer to the same network/access point/router with which the printer is connected. Then try again connecting the PC to the printer. If this does not resolve the issue, proceed to the next step. Step 5: Using the setup CD-ROM packed with the printer, reinstall the MP driver. Q. Is your multipack consists of separate cartridge for each colour or does it have cyan, magenta and yellow inks in one cartridge?